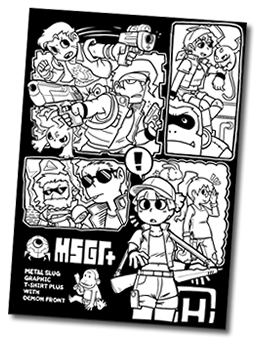 recent, I was draw KR Metalslug big fan PangGuin's MS graphic T-shirt next version design. this time design, featuring MS fighters and Taiwan game maker IGS games "DEMON FRONT " fighters. do you know "DEMON FRONT"? it's games near METALSLUG taste! it's apparently famous in Korea. this T-shirt has been scheduled sell on this June. also exhibiting other design(Famiri, and WhiteBoard) on PangGuin's web site.